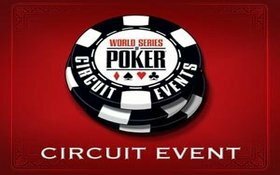 When the final table for the World Series of Poker Circuit Series Main Event in Tunica, Mississippi began everyone’s attention was focused squarely on Kurt Jewell, who was looking for his second Gold Ring in the past six months on the WSOP Circuit Series, having won the Main Event in Hammond, Indiana back in October. Alas, it was not meant to be for the poker pro, who has been tearing up the poker world in the southern US. In the end it was Kentucky native Sam Barnhart who would walk away with the Gold Ring, $148,162 in prize-money, and an entry into the $1 million WSOP Circuit Series freeroll tournament that will take place in May at Caesar’s Palace in Las Vegas, Nevada –just prior to the World Series of Poker. This entry was posted on Wednesday, February 16th, 2011 at 11:59 am and is filed under Poker News. You can follow any responses to this entry through the RSS 2.0 feed. You can leave a response, or trackback from your own site.